The final contractor EM database became available for assessment on 06/12/2012. The data considered are the LF (3005 Hz) and HF (11962 Hz) apparent resistivities and their associated coupling ratios (P, Q) together with radar altitude. The smoothed final radar values (radar channel) supplied by the contractor are used here. The area of the Conroy survey (Figure 1) allows a comparison of the resistivity/conductivity information provided by 2 contractors and separated by ~6 years in time. 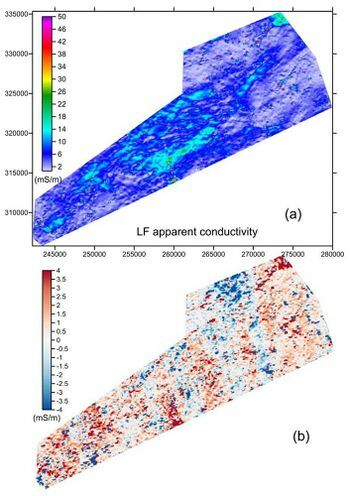 The LF apparent conductivity provided by the TB survey is shown in Figure 17a. The observed conductivity variations are modest (e.g. largely <15 mS/m) with isolated large amplitude noise spikes dispersed across the area. The JAC delivered data was gridded in precisely the same way (NN grid at 50 m) and the resulting grid was subtracted from the TB grid. The difference image is plotted in Figure 17b and is restricted to the range from +/-4 mS/m. The difference grid actually ranges from -951 to +995 mS/m due to the noise sources. The difference grid statics indicate a median value of 0.39 mS/m which implies a very good correspondence. In detail, low/high slight amplitude modulations (in the flight line direction) are likely to be associated with differences in levelling the EM data. Figure 17 (a) TB LF apparent conductivity. (b) Difference LF apparent conductivity TB minus CONROY. The analysis was also undertaken using the HF data sets and the equivalent results are shown in Figure 18. The TB HF conductivity variations display some higher amplitudes and less noise (in the form of spikes) than the LF data. The HF difference image (Figure 18b) indicates a persistent zone in which TB values exceed the JAC values by ~4 mS/m but the differences undulate in association with the conductivity variations. Despite this behaviour, median and trimmed mean values of the differences are only 1.55 and 1.83 mS/m, respectively. Figure 18 (a) TB HF apparent conductivity. (b) Difference HF apparent conductivity TB minus CONROY. The TB EM data are provided at a 10 Hz along-line sampling interval. This is a factor of 4 greater than the previous data sets sampled at 4 Hz. 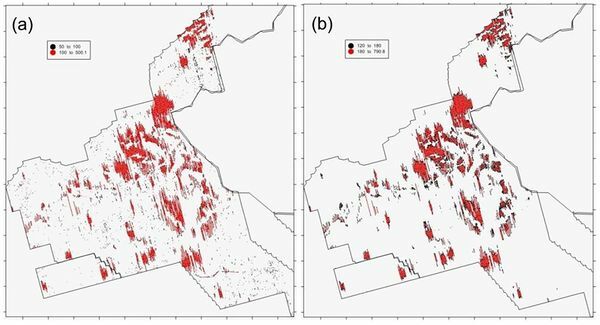 The typical along-line sampling was previously <15 m; the TB data are sampled at a typical distance of 6 m. Both along-line sampling intervals are much less than the lateral footprint of the EM system at the nominal survey altitude (e.g. Beamish, 2004) and it may be possible to exploit this sampling redundancy when localised errors and noise sources within the data set are more fully understood. The contractor delivered EM data provides 9 187 435 samples across line numbers ranging from L1000 to L2021. Both the TB and OST data sets are included and are analysed jointly here. A set of lines L2001 to L2021 are from a small 100 m infill survey within the OST survey and are not included in the merging procedure considered here. The reduced data set comprises 9 177 657 data points. 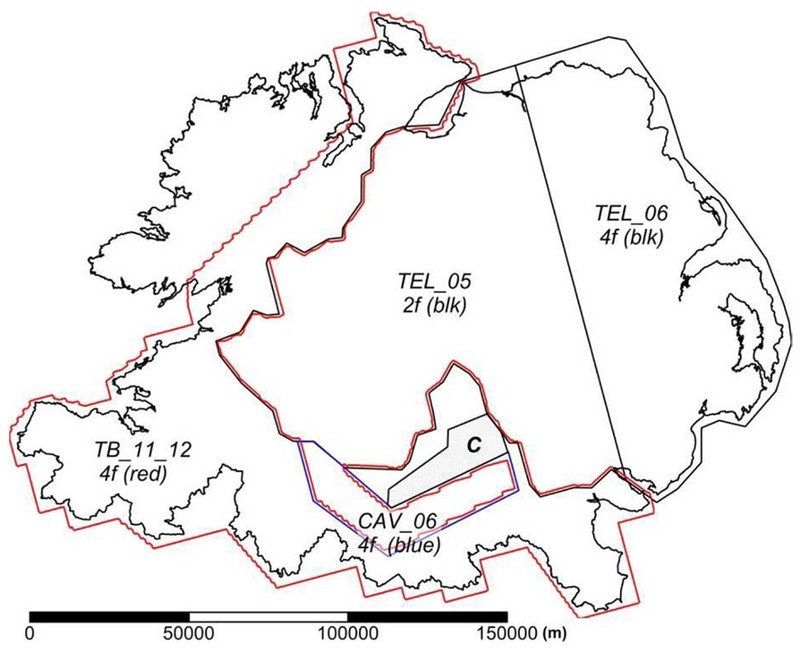 The radar altimeter (radar channel) ranges from a low of 26 m to a high of 791 m.
Although the TB survey was carried out across largely rural areas, the high-fly zones are a feature of the TB survey, particularly across the western area. There is therefore a zonal/swathe effect of reduced accuracy and integrity of the EM data within these areas. As noted in the contractors report, the P, Q values were levelled with a type of FMD procedure involving a low-order polynomial model fitting of the data (Beiki et al., 2010). It is not clear how the algorithm performs in the presence of spatially-persistent high-fly errors. The delivered P, Q values were also microlevelled although the preceeding FMD procedure should have removed any residual line-to-line corrugations. As previously the inversion of the TB data provides an analysis of the variation of misfit with altitude. The behaviour of the misfit error (restricted to <500%) and RALT for the LF and HF data is shown in Figure 19. The data considered is a subset of the whole data set comprising 2 605 893 data points from the initial (western) set of lines L1000 to L1300. Figure 19 Variation of L1 misfit error (clipped to 500%) and radar altitude (RALT) for the TB data set Lines L1000 to L13000. (a) LF and (b) HF. For practical purposes (efficiency of grid construction) the TB data set was split into 2 (west and east) subsets for processing. The western subset comprised Lines 1000 to 1480 and the eastern subset comprised Lines 1481 to 1946. Five lines of overlap (for merging) between the 2 subsets were also introduced. For the combined TB dataset (Lines 1000 to 1946, no overlap) the inversion result statistics providing the standard culling rejection limits of ERR>100%, RALT>180.0 m together with the combined rejection statistics are given in Table 2. Table 2 Statistics (number of values and percentages of total) of the TB inversion results using standard rejection criteria of ERR>100% and RALT>180 m, together with their combined rejection statistics. It is suggested that the higher levels of rejection observed in the TB data are due to the higher sampling interval (x4) of these data. An example of the misfit and RALT behaviour across the western subset is shown in Figure 20. An example of the misfit and RALT behaviour across the eastern subset is shown in Figure 21. Figure 20 (a) Observed L1 misfit errors for the TB LF western data (5–100% in black, 100 to 500% in red). (b) RALT for the TB western data (120 to 180 m in black, 180 to 791 m in red). Figure 21 (a) Observed L1 misfit errors for the TB HF eastern data (values >100%). (b) RALT for the TB eastern data (Values>180 m). ↑ BEAMISH, D. 2004. Airborne EM skin depths. Geophysical Prospecting, 52, 439–449. ↑ BEIKI, M, BASTANI, M, and PEDERSEN, L B. 2010. 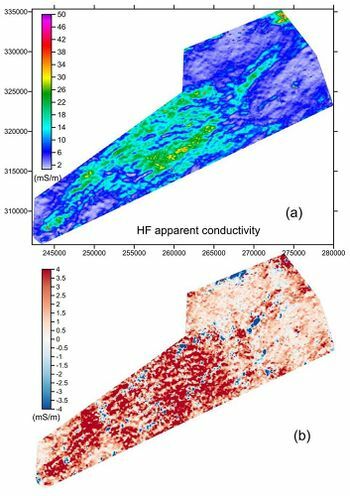 Leveling HEM and aeromagnetic data using differential polynomial fitting, Geophysics, 75, L13–L23.